After a look at what amounts of people of different ages of people use life insurance, a survey conducted by Life Ant has found that new mothers are woefully under-insured. According to the survey, Life Ant has found that less than 20% of new mothers under 30 have life insurance coverage. Even more troubling, the younger the new mother, the less likely she was to be insured. This potentially represents a significant financial danger for new families, and a growing danger as young people seem more prone to be uninsured. The entire generation seems to show less affinity for life insurance products, and women, and in particular new mothers represented a much higher percentage of the uninsured population. Younger people also tend to have less money in total savings, and if an income earning parent passes away it presents a very large financial burden for the remaining members of the family. Even if the remaining parent has access to another care giver such as a grandparent, it will be very difficult for a family with no savings and less earnings potential to overcome the shortfall. While mothers are not always the income earners in the family, the loss of any caregiver still presents a family with a large financial responsibility. Not only are the funeral and grieving costs expensive, but most often the remaining parent must pay an expensive daycare bill to replace the previous caregiver. According to a 2013 article by the New York Times, day care costs can reach about $30,000 per year per child. Even with a bill half this size most middle income families would struggle to meet the challenge of providing care. Even unemployed mothers tend to re-enter the workplace after their child reaches school age, and the future loss of income can certain hinder the prosperity of the remaining family members, especially when considering how much needs to be put away to cover retirement spending. One trend offering insights into why most new mothers are not insured is the reduced usage of a financial advisor by the “millennial generation” compared with previous generations. Historically, the act of speaking to a financial advisor before starting a family was considered a necessary step to ensure that the family would remain financially secure as they grow older. It seems that younger generations perceive less value from using a financial advisor than older ones do, and instead they show a preference for managing their own finances with the help of online resources. There is nothing inherently wrong with taking financial planning into one’s own hands, but a lack of understanding regarding the full scope of financial planning often causes people to either intentionally or net omit life insurance from their financial plan. Perhaps part of the reason is that while there are many online resources that exist and are widely used for investment planning and research, few people are aware of resources which may help them fill their life insurance needs. With young generations showing a preference to manage their funds without the help of a financial advisor, it may be necessary for the life insurance industry to to explore alternate ways for young people to access life insurance. By providing them with the ability to shop for and apply for life insurance online without interacting with an advisor, it may help people of younger generations to overcome their reluctance to purchase life insurance. 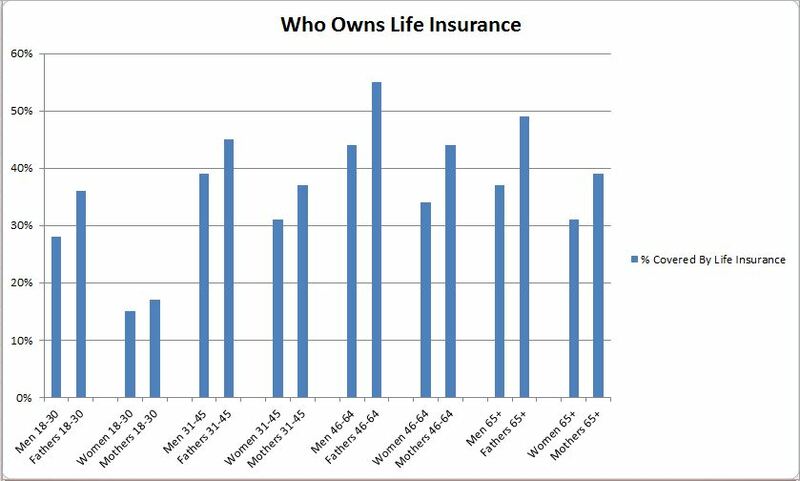 It should also be noted that young people, and women in particular have the least expensive costs for life insurance coverage. A moderate amount of term life coverage can be purchases by most people under age 30 for less than $20 per month. However it’s affordability seems to do little to sway the choice of this younger generation to forego seeking coverage. Perhaps with better online resources and understanding of the costs, younger families will not be left without this crucial coverage which is so important for their family’s financial well being. *While the data set may not satisfy all requirements for a statistically highly significant analysis (unknown selection effect due to non-randomized survey participation, relatively small number of participants), the data set still gives qualitative valuable insights and allows us to derive new hypothesis which helps demonstrate purchasing decisions of broad consumer sets.